Australian Expat Building a House in Thailand. A step by step guide showing how I built this house in Thailand. As an Australian old age pensioner, I live in Hang Dong, Chiang Mai, Thailand, on a retirement visa. My Australian pension is channeled into my Thailand bank account. See more about Pension. I built the house in Chiang Mai for the family who will care for me in my old age. The block of land was all thay had and I was renting a cabin for 3,000 baht a month while receiving 100,000 baht a month from pension and rentals, as I had no collateral the house was built using my income. If I become very old and demented, I believe I will be cared for better than the care I am destined to receive if I remain in Australia, and my pension money is helping worthy people. The family here are Thai buddhist and genuinely good and caring people, so my pension will support them well, until I part. Plus, living in Thailand is great as many people like myself are realizing. 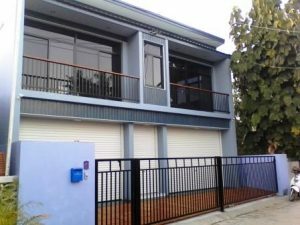 If you are thinking of building in Thailand, here is my advice from experience. My building experience comes from many years working on cottage and industrial building sites in Australia. I worked as the supervising builder and as a trades person throughout this project. The general rule in Thailand is that a foreigner cannot take a Thia persons job but I was not challenged by anyone about this, maybe because I was not being payed to work. There are standard procedures, laws, traditions and specifications which need to be observed and these are basically common sense matters. Some of the cultural traditions were unfamiliar to me and I will mention them. I can’t speak the Thai language, things were usually sorted out as I know enough about building to see what needed to be done and because the other person has skills and knew what was needed. My lady friend, Saloong, was great at sorting out who got payed and when, this is where you need a Thai speaking offsider, even if they are not a builder. The total cost would have been about $60.000 Australian. That does not include buying the land or my personal labor. Local government authorities did not come onto the site without my invitation. The 220 volt electricity supply company made a brief inspection before upgrading the meter. There are a few options of how to acquire land. I’m wanting to give you the ‘how to build’ side of it and I presume that you are a handyman or have a fare amount of building experience so you will know what I’m talking about. We will look at the progressive stages of building the house – Including the pitfalls and mistakes that I made. Laws can vary, building specifications, soil types, work practices, building materials, wages etc. could differ in other parts of Thailand – I am in Hang Dong, Chiang Mai. Ownership Generally – foreigners cannot own land in Thailand – they can lease land for up to 30 years, or form a company with the bigger percentage of shareholders being Thai citizens. If you are married to a Thai person then the normal thing to do is to purchase land in your partner’s name. Ownership laws are clearly defined in Thailand and you might want to do some study on the subject. I am too old to worry about who owns what. If the neighbors house is not too close you might drive concrete columns into the ground for footings. See notes on Pile Driven Footings. Some of the traditions local traditions should be studied, see Cultural Considerations when Building in Thailand. Also you should know about Hiring Building Workers in Chiang Mai Thailand. The following pages explain my building progress in Chiang Mai Thailand. FILL THE BLOCK The land cleared and filled to street level. FENCING A temporary fence placed around the block. ALIGNMENT AND PROFILES The profiles put in place, alignments checked. PLANS AND ENGINEER Plans for the house drawn up. 220V POWER The temporary power supply pole erected. SEPTIC TANKS Holes dug for septic. FOOTINGS Footings dug and poured. PILE DRIVEN FOOTINGS My brief knowledge. LOWER COLUMNS Columns formed and poured. CONCRETE BEAMS Beams for ground floor poured. CONCRETE FLOOR Ground floor concrete poured. COLUMNS TO SECOND FLOOR Columns to second floor poured. BEAMS SECOND FLOOR Beams for top floor poured. POUR SECOND FLOOR Top floor and stairs poured. COLUMNS TO ROOF Posts to roof poured. STEEL ROOF Steel roof beams, rafters and battens. BLOCK LAYING Brick walls and window beams. TILING Wall and floor tiles. HOUSE PAINT House painted inside and out. WINDOWS AND DOORS Windows and doors installed. FITTING OUT Shelving and cupboards installed. Carry on browsing these pages for further information and images about building a house in Thailand. Go to the next page – Cultural Considerations when Building in Thailand.